This past week was an interesting one as far as my writing is concerned. I finally made the big decision to cut one of the supporting characters. I'd been thinking about this for some time, but it was a difficult decision because I liked the character. He provided some meaning to the overall storyline, too, but not enough that his part couldn't be supplemented here and there by others. So, he's gone. 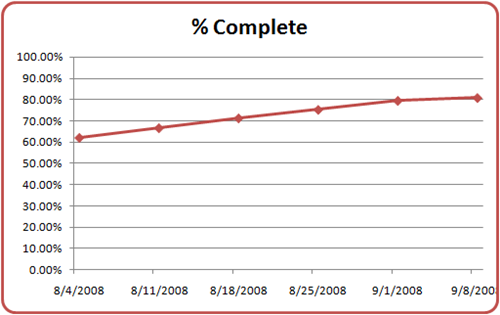 That cut by itself removed about 7,000 words from my last week's total of 122,866. That along with some additional material needed to fill-in some of the resulting gaps brings me to a current total of 115,664. Still not down to the 110,000 I had determined I needed to get to, but a lot closer. 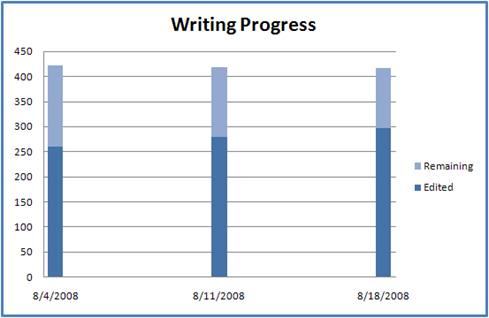 That puts me at a current editing page of 316, down from 329 last week (note the backward progress from that perspective), with 75 pages remaining. That's down 10 pages from last week, so some forward progress there. I don't like that nearly flat line at the end. Here's the bottom line: I dropped the total word count from 122,866 to 115,664, total pages went down from 414 to 391, and pages remaining to edit went down from 85 to 75. All told, not bad. The game plan at this point is to continue moving forward. I had to reorder one scene, but that's nearly done. At some point, I'll have to go back and fix some of those scenes where the missing character is no longer there. I'll probably save that work for my second pass edit. This Monday's writing progress is coming in a little late because (1) today is Labor Day and thus a holiday and (2) my wife and I have been out all day biking and then celebrating my dad's birthday. However, I do have some progress to report, so let's jump into it. I'm currently editing page 329, an improvement of 16 pages over last week's status. That puts me at a completion percentage of 79.47%. 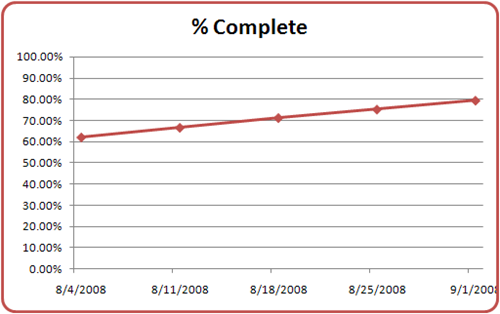 Last week I was at 75.24%. A few more stats: Total pages dropped by 2 to 414, word count dropped also from 123,508 to 122,866. That's about it for this time. I'm still chugging away on editing, and I think based on some information I found and posted about regarding total word count I have a tough decision to make. I'm going to have to cut something fairly big in order to reduce the total word count down to where it needs to be. I have something in mind, but I need to finish the first pass, then take a look at the big picture before I make any rash decisions. I almost had to write this report with not much progress to go over. Fortunately, my measly progress during the week last week was aided by some more serious progress over the weekend. You can see some definite trending upward on the dark blue (lower) portion of the bar. That's my editing progress. Of course, the lighter blue (upper) portion of the bar is gradually diminishing in size, which of course means there are fewer pages remaining to edit. It's all so scientific. 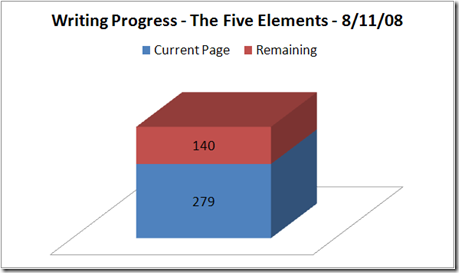 Week-to-week, total page count decreased by 1 page from 417 to 416. Current page edited went from 297 to 313, an increase of 16 pages. Not great, but not bad. That leaves 103 pages left to edit on this first pass. I'm currently 75.24% complete with this first pass edit. I was really hoping to have at least 20 pages edited by this report; now I have a goal for next week. It's Monday, so time for a writing progress update. 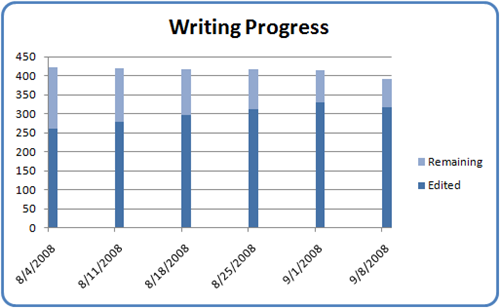 As I indicated in my first writing progress update, I'm putting these out each week to hold myself accountable for editing progress on my current novel-in-progress. Current total page count dropped 2 pages from last week to 417 pages. I've edited 297 pages, up from 279 the previous week. 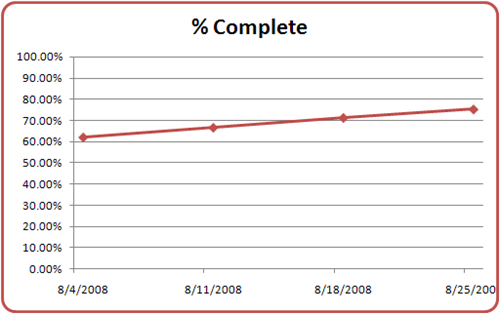 That gets me to a completion percentage of 71.22% compared with last week's 66.59%. Can you tell I'm an engineer yet? Bottom line is I think I'm making good progress. Not as well as I would like, but it's a constant battle against distraction, how much time to spend on blog posts, and actually having a little down-time every once in a while. I think I see light at the end of the tunnel, at least on this first pass edit. More progress next week. 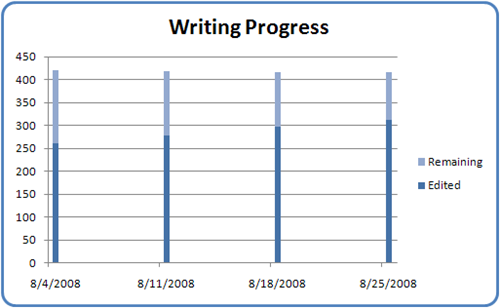 As promised, I'm going to report my writing progress each and every Monday. Last week, my current novel-in-progress stood at 421 pages or 125,037 words. Also, I was editing page 261. I'm currently mired in a first pass, which means I'm paying attention to flow, grammatical mistakes, and general sentence revisions. Basically anything that's out of place or inconsistent gets whacked or fixed. I'm leaving behind "markers" in places where I know I need to go back and add more or new content. I do that simply so I can focus on getting to the end of this first pass. Subsequent passes are inevitable, but I want to be able to look at the "big picture" and not waste time refining details just yet. Who knows if this or that detail will actually make the final cut; I don't want to spend time working something that's just going to get tossed. So, just like pushing onward with trying to complete the novel is important, so is pushing forward with the completion of each revision. Now, as far as progress goes, I'm 18 pages closer to the end (279 – 261 = 18 pages). I suspect the total page count will continue to decline; my goal is to get it down under 120,000 words. It's tough determining what stays and what goes, but it has to be done. 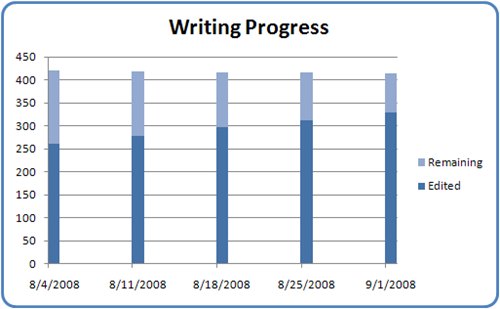 Total word count is an important factor for new writers. It's a topic I've been meaning to address with a separate blog post. That's it for this past week's progress. Next report in a week.